The recent discovery of a wooden chest, unopened for 100 years revealed a treasure trove of eloquent trench diaries, letters and poetry. 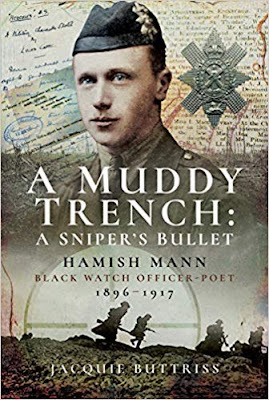 The author was Hamish Mann, a young Black Watch subaltern killed in France in 1917 just five days after his 21st birthday. Thanks to Mann's outstanding literary gifts and prodigious output, this book re-lives his fateful journey from the declaration of war, his voluntary work at a military hospital, his training and commission and, finally, his service with 8th Black Watch on the Somme. The daily hardship and trauma he experienced at the Front were shared with countless thousands of his comrades. But Hamish's extraordinary gift was his ability to record the traumatic events and the range of his emotions, writing often in his dug-out 'by the light of a guttering candle'. A century on, thanks to the Family's discovery and Jacquie Buttriss's sensitive commentary, Hamish's tragically short life can be celebrated and his literary legacy given the recognition it so richly deserves.